If you’re having friends over and you don’t have much time to cook, here’s a finger food recipe you can whip up in a jiffy. Our version of the popular buffalo wings is as easy as frying chicken and coating them with our savory Lily’s Peanut Butter sauce. The balance of sweet and piquant flavors of the sauce packed with biotin and vitamin C isn’t just for fried meats, it can also go well with grilled dishes or as a dip! Dredge chicken wings with breading mix. Heat oil for deep frying in a sauce pot. Fry chicken wings and place in a strainer to drain oil. Set aside. In a saucepan, heat butter and saute onion and garlic until onion is translucent and garlic is golden. Mix in sesame oil, Lily's Peanut Butter, and water. Add broth cube and siling labuyo and continue to stir. 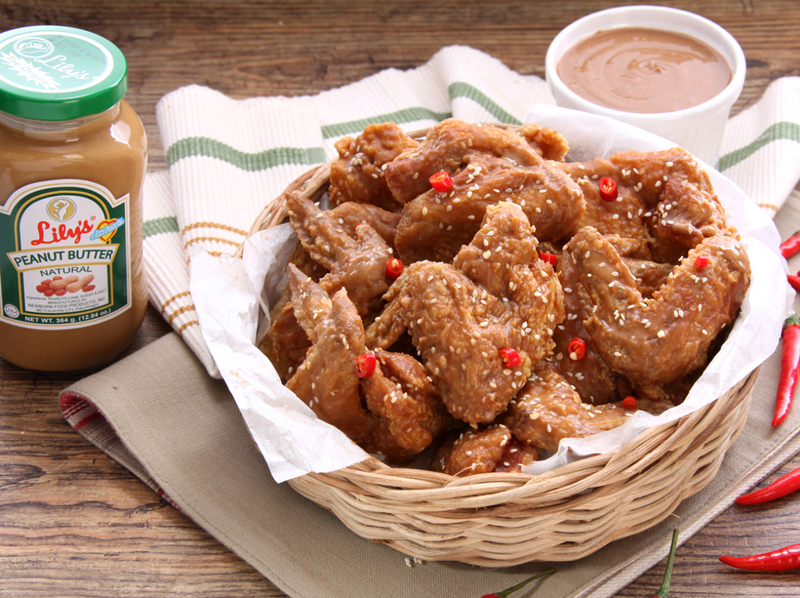 Toss fried chicken wings in prepared sauce and sprinkle with toasted sesame seeds. Serve hot.